The film documents the performances and history of The American Magic Lantern Theater, a troupe that recreates the 19th century spectacles of magic lantern shows—the live projected productions that preceded cinema over 100 years ago. AMLT, based in Connecticut, consists of two people, usually Terry Borton, founder and showman, and lead singer Nancy Stewart. 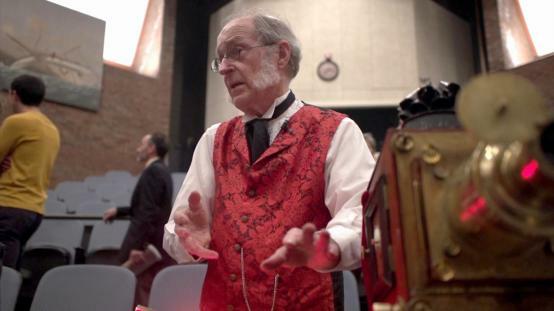 The company has been performing for 20 years, is the only professional magic-lantern theater in the US, and is one of the only three existing in the world. Terry Borton is not only an amazing performer but also a magic lantern historian and author (with his wife) of a book on the subject, Before the Movies. He is a great story teller who spins fascinating tales about his family’s long-time love affair with magic lanterns—stories that go back to his great-grandfather in 1900. He discusses the history of the medium, and how he himself evolved from a being a school teacher and editor of Weekly Reader to a performer. Borton’s narration is interwoven with scenes of live performances from AMLT’s shows, and with interviews from his wife Debbie and singer/accompanist Nancy Stewart. Other people appearing in the video include Terry’s father conducting a family lantern show, and two prominent collectors and historians of magic lanterns, Richard Balzer and Kent Wells, who discuss with Borton their private collections of magic lanterns and other optical toys.